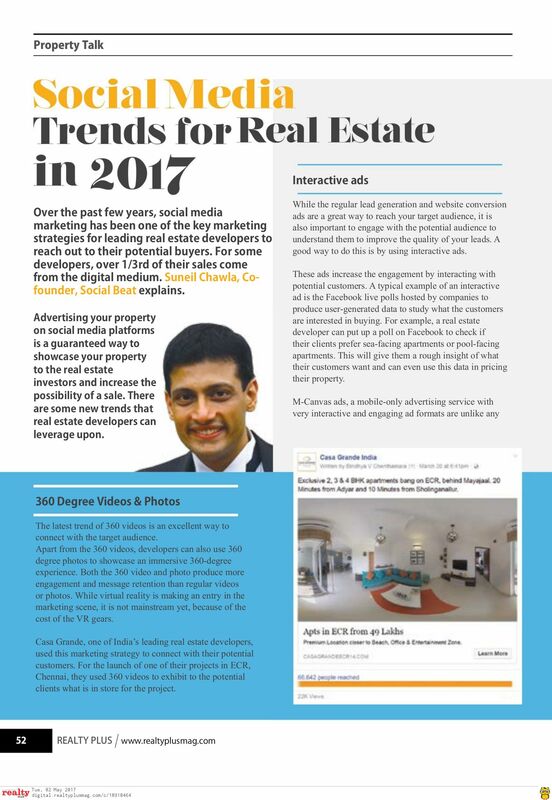 Over the past few years, social media marketing has been one of the key marketing strategies for leading real estate developers to reach out to their potential buyers. For some developers, over 1/3rd of their sales comes from the digital medium. Advertising your property on social media platforms is a guaranteed way to showcase your property to the real estate investors and increase the possibility of a sale. However, just posting images of your next upcoming project may not be captivating enough. Here are some new trends that real estate developers can leverage upon. What if you could give your potential home buyers the luxury of a walkthrough of their new apartment without them leaving their homes? Sounds too good to be true? The latest trend of 360 videos will let you do just that. It is an excellent way to connect with your target audience and show them home buyer what is in store for them if they buy your apartment or villa. While virtual reality is making an entry in the marketing scene, it is not mainstream yet because of the cost of the VR gears. However, if you are looking for an engaging video, then a 360-degree video is a good starting point. These videos can be created through low-cost tools as well. This trend is highly beneficial for real estate for developers to showcase their upcoming projects. Apart from the 360 videos, developers can also use 360-degree photos to showcase an immersive 360-degree experience. Both the 360 video and photo produce more engagement and message retention than regular videos or photos. 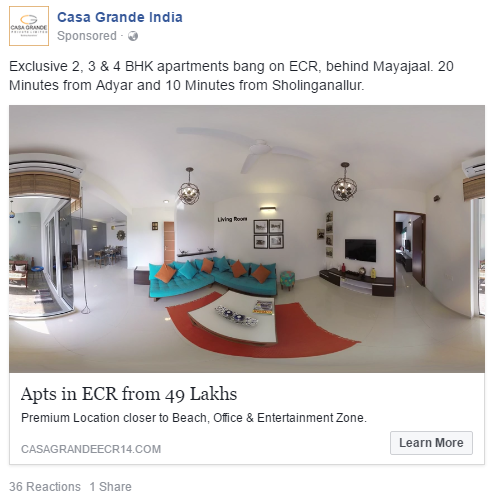 Casa Grande, one of India’s leading real estate developers, have used this marketing strategy to connect with their potential customers. For the launch of one of their projects in ECR, Chennai, they used 360 videos to exhibit to the potential clients what is in store for the project. With organic reach on Facebook almost dead, brands are using focused advertising to reach their potential audience on Social Media. While the regular lead generation and website conversion ads are a great way to reach your target audience, it is also important to engage with the potential audience to understand them to improve the quality of your leads. A good way to do this is by using interactive ads. Interactive ads are the next generation of ads, which has taken social media marketing by storm. These ads increase the engagement by interacting with potential customers. A typical example of an interactive ad are the Facebook live polls hosted by companies to produce user-generated data to study what the customers are interested in buying. For example, a real estate developer can put up a poll on Facebook to check if their clients prefer sea-facing apartments or pool-facing apartments. This will give them a rough insight of what their customers want and can even use this data in pricing their property. If you are looking at the next level of interactive advertising, try out M-Canvas ads, a mobile-only advertising service with very interactive and engaging ad formats. They are unlike any other format available on social media. They are highly interactive and uses a mix of images, video, and carousel to create a memorable and stunning visual experience on mobile. Moreover, these ads allow you to interact within the publisher i.e while you are reading your news article on the same page you can interact with the ad, rather than going to a different page. Once you click, the ads expand and give your further information and ensure the viewer interacts with the ad to take the next steps. It is one of the best ways to showcase real estate products. For example, if your end goal is for your customer to enquire about the project, you can show a sneak preview of the project’s interiors with Call to Action that prompts viewers to take the next step. An audience who's interested enough to swipe all the way through your ad is likely willing to click through to your website and make the enquiry. These canvas ads are a new concept that is catching up, and we see it as a trend that is here to stay. Micro-targeting is a marketing strategy of using consumer data and demographics to identify the interests of specific individuals and then influence their action of making a purchase. If a property is for sale on OMR in Chennai or in Whitefield in Bangalore or BKC in Mumbai, with three bedrooms, three baths and is close to the IT corridor, then it is most likely to be bought by a working professional in his 30s with a family of two kids. 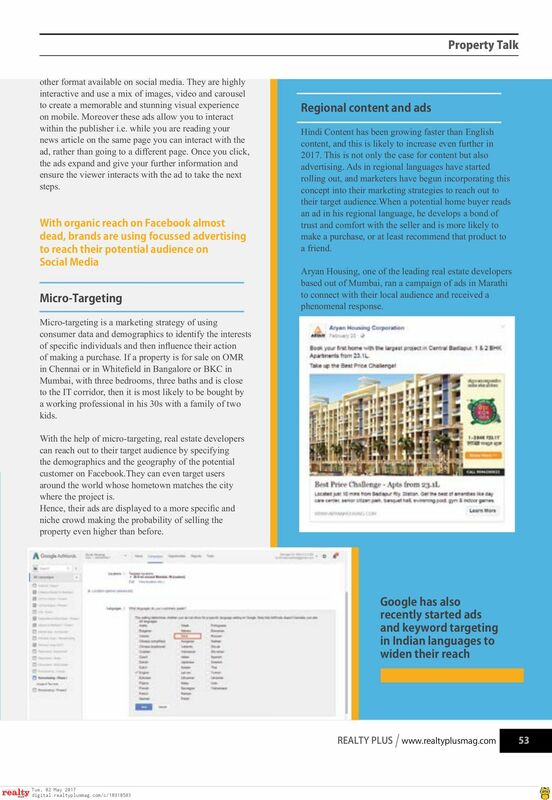 With the help of micro-targeting, real estate developers can reach out to their target audience by specifying the demographics and the geography of the potential customer on Facebook. You can even target users around the world whose hometown matches the city where the project is. Hence, their ads are displayed to a more specific and niche crowd making the probability of selling the property even higher than before. Hindi Content has been growing faster than English content, and this is likely to increase even further in 2017. This is not only the case for content but also advertising. if you looking to reach a wider audience, especially in the tier II and III cities, then using regional content is a must. Ads in regional languages have started rolling out, and marketers have begun incorporating this concept into their marketing strategies to reach out to their target audience. When a potential home buyer reads an ad in his regional language, he develops a bond of trust and comfort with the seller and is more likely to make a purchase, or at least recommend that product to a friend. 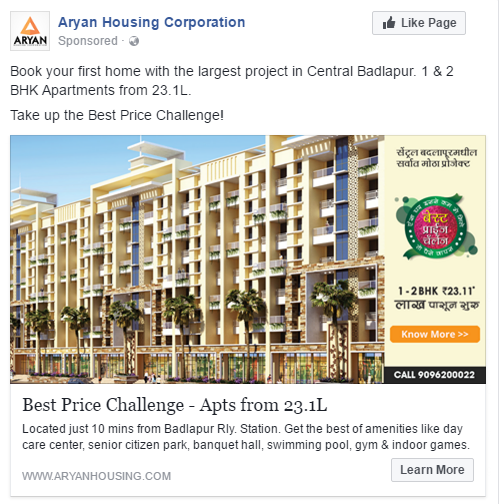 For example, Aryan Housing, one of the leading real estate developers based out of Mumbai, ran a campaign of ads in Marathi to connect with their local audience and received a phenomenal response. Understand this trend, Google has also recently started ads and keyword targeting in Indian languages to widen their reach. While the majority of the first time home buyers are researching online, they make the end decision of buying the property offline only. So for a real estate company, integrated offline and online marketing efforts is highly essential. While it is important to run ads and get leads, it is also important to understand that consumers do not make purchase decisions based on a single ad or message alone. Potential buyers gather all their information from various channels and this data gathered through several stages of the buying process are the building blocks of sales. If you have a potential lead from an online ad and your sales team is following up with them, it is important to also reach out that potential lead online as well. You could use automated email or drip email to reach them until they actually make the purchase. Real Estate developers can target and constantly stay in touch with a group of people based on certain criteria. Let's say that a customer has visited property website and shown interest by coming for a site visit, digital marketers can use the information provided by the customer to send emails about the development and completion of the property and news on various other related properties. Drip emails are a powerful lead nurturer, with statistics showing a 119% increase in click-through rate via trustworthy emails. Advertising across social media platforms is all about building your brand and making it a household name for people to connect to and rely on. 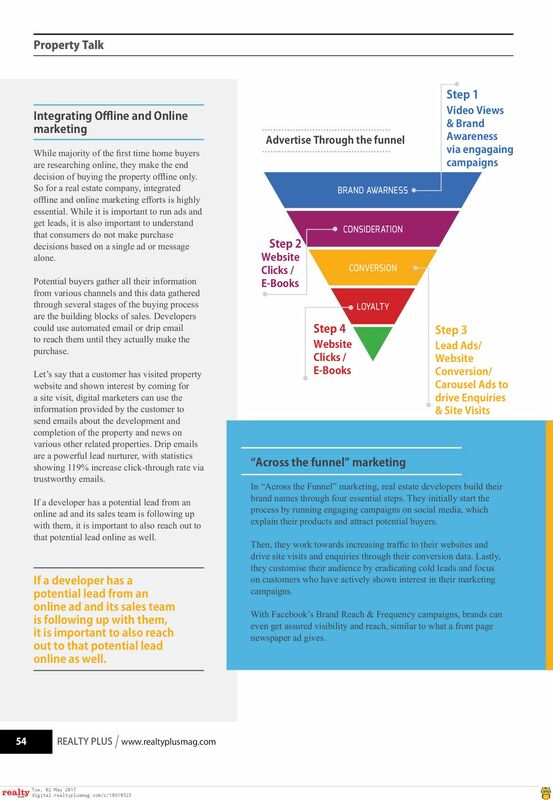 In “Across the Funnel” marketing, real estate developers build their brand names through four essential steps. They initially start the process by running engaging campaigns on social media, which explain their products and attract potential buyers. Then, they work towards increasing traffic to their websites and drive site visits and enquiries through their conversion data. Lastly, they customise their audience by eradicating cold leads and focus on customers who have actively shown interest in their marketing campaigns. With Facebook’s Brand Reach & Frequency campaigns, brands can even get assured visibility and reach, similar to what a front-page newspaper ad gives. All of these social media marketing strategies are currently trending in 2017 and are here to stay! Which of these techniques will you be adopting in your social media marketing strategy? Tell us in the comments below. Content marketing blogs to follow. In the meantime, go through our complete guide for digital marketing for real estate. This article was originally published in Realty Plus Magazine. Great post. 360 degree videos are providing potential customers great ease while choosing their properties. What's your perspective about incorporating Virtual reality and Augmented reality in e commerce platform.